What is the best preference of tourism in Banten Regency? It can be anything. If you look for a unique tourist spot, there is Pintu Air Sepuluh Dam. The location is in Koang Jaya Village. You only need to head to Karawaci, Tangerang to reach the location. The dam is actually the heritage of the Dutch Colonialism. It remains functioning and the condition is good either. Today, the dam becomes a tourist lure in Karawaci. People come to this location for hanging out and taking pictures. Somehow, the sound of the water is mesmerizing. As mentioned before, the dam is still in a good condition. There are no damages at all. Thanks to the local government. The water flows flawlessly, but the color of the water isn’t quite clear. As the name suggests, there are ten waterways. Pintu means “door” and Sepuluh means “ten”. The size isn’t quite big either. In some parts of the dam, you can see grassy land. It is situated in the river bed. No wonder, visitors often spend their time sitting in such area. There is another name, actually. The locals also call it Pasar Baru Irigasi Cisadane Dam. As the name implies, the dam is located in Cisadane River. Also, it is situated near to Pintu Seribu Mosque. The dam isn’t an official tourist spot, though. In fact, there is no parking area. Visitors can park their vehicle near to the river bed. The most crowded time is in the afternoon, where people enjoy the stunning atmosphere before the sunset. Most of them carry a camera, too. So, what is about Cisadane River? It flows passing through Banten and West Java Province. The length of the river is about 80 km. The source of water comes from Salak Mountain in Bogor Regency. It flows through the way to the Java Sea, actually. The best feature of the dam is the waterways. There are tens of them. In fact, each of them has the width of 10 meters. The dam was built during the Dutch Colonialism. It was in 1927. However, the dam started operating since 1932. During the construction, the Dutch Government decided to hire man powers from Cirebon. Thanks to this extra, the project ran smoothly. If you come at the right time, you may see several kids playing in the water. It is because the water is receding. Also, some locals often visit the dam for fishing. Due to this reason, fishing becomes one of the reasons in visiting the dam. All tourists should try this activity, for sure. 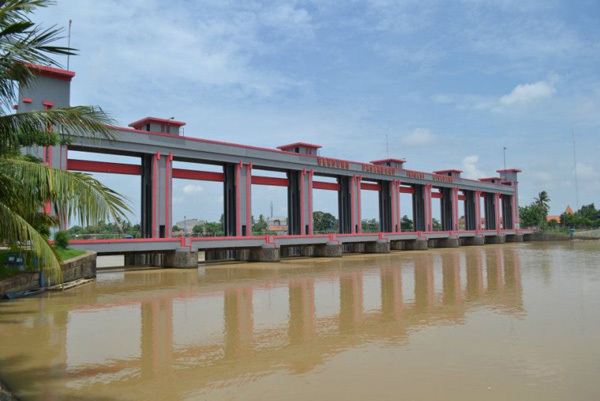 For those who want to visit the dam, your primary destination is Tangerang. It takes 1-2 hours from Jakarta and the distance is 39 km. The fastest route will be Pantura Street. Also, it is better to ride a private car than a bus. Once you reach Tangerang, It is time to visit Karawaci. The dam is situated in Koang Jaya Village and it is near to Jami Nurul Iman Mosque.